J.K. Rowling is probably the most successful authors in the world, but that’s not why I chose her for today’s Operation Inspiration. It isn’t her fame or her wealth that inspires me. It’s her tenacity. She didn’t have the easiest life starting off or the best circumstances in which to write, but she didn’t let that stop her. She didn’t let motionless trains, rollercoasters, the absence of Dory (from Finding Nemo), or typewriters get in her way. Not following me? Let me see if I can explain it better. She took inspiration when it came, and ran with it. When your train is delayed you can look at your watch and start complaining to other passengers, or you can write a million-dollar book. It’s your choice. Easy right? I know, I’d look at my watch too. Ok, so J.K. Rowling didn’t know that million-dollar inspiration was about to hit her, but that’s the point. None of us really know what moments will change our lives forever. Most of the time, we walk past those moments because they’re too simple to seem life-changing. J.K. Rowling didn’t know that a moment as simple (and annoying) as being stuck on a train would change her life in as many ways as the moment Harry found out that he was going to Hogwarts. 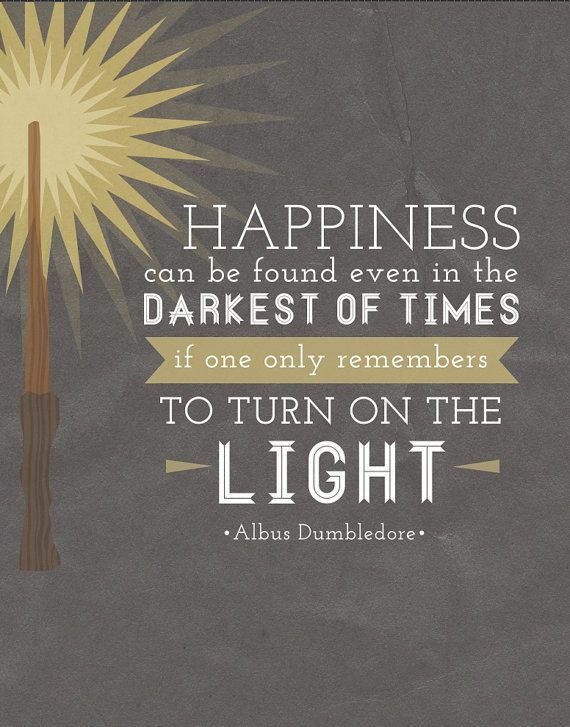 We may not have Harry and the whole world of Hogwarts in our head, but the inspiration that Rowling found on the train reminds me to be open to inspiration anywhere. It doesn’t have to be a magical moment with multi-colored glitter and violin music (actually, can I have one of those moments?). Even a bad situation can bring good things if you’re looking for them. It wasn’t the best time to write a book, but she did it anyway. We all have a goal. 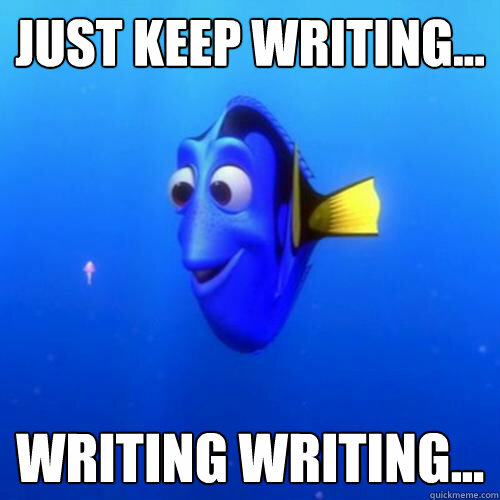 Maybe it’s to write a book, maybe it’s to write a blog post, or maybe it has nothing to do with writing at all. Whatever our goal, things always seem to get it the way. Things like life. You know that thing that you can’t control, that feels a bit like a rollercoaster without a seatbelt? Well, J.K. Rowling didn’t let the rollercoaster or the missing seatbelt get in her way. She had just been through a divorced, a move to yet another country, and went through her mother’s passing. She was a single mother staying in public housing and living on welfare. With all of this, it isn’t a surprise that she was diagnosed with clinical depression. She must have felt completely overwhelmed and alone. If anyone had a reason to give up on her dream, it was J.K. Rowling. But she didn’t give up. She found inspiration even then, in the darkest time in her life. It was her depression that inspired her to create the Dementors. I guess sitting on that stopped train taught her something. Even a bad situation can be inspirational. She made time when there wasn’t any. Being a single mom meant that everything, and I mean everything was up to her. She hardly had time to take a five second shower in peace, much less write a 76,944 word book. Most people crash on the couch in an exhausted stupor when their infant finally lays down for a nap, but not superwoman Rowling. She wrote. Most people spend their lunch break searching Pinterest for memes that make you laugh so hard your latte will come spurting out your nose. Not Rowling (granted, Pinterest wasn’t around then…she would have been just as sucked in as the rest of us). She spent her lunch breaks writing. Most people sleep at night, but that wasn’t good enough for J.K. Rowling. Take a guess at what she did. Write. Write. Write. She didn’t let what she didn’t have get in her way. Have I ever mentioned that I love my computer? Writing is so much easier with one of those. But what if I didn’t have one? J.K. Rowling wrote her first book on a typewriter. Before that, she wrote everything on something called *gasp* paper. While I like to take a break from the computer screen every now and then and write in a notebook, I must admit that I’m spoiled and would complain if someone forced me to write using only a pen or that clacking monstrosity somewhat similar to a computer keyboard; a typewriter. No Microsoft word? No spell check? No copy paste? This typewriter thing does have google search doesn’t it? J.K. Rowling didn’t care that she didn’t have the latest thing or the greatest tools to work with. She knew she had a dream and she was going to use whatever she had to achieve it. So who cares if you don’t have Scrivener, high-speed internet, or a fancy desk. Your dream is worth pursuing. Your story is worth telling. Just be glad you aren’t pecking it out on a typewriter. She worked on her book for five years. Standing ovation please. That is a long time to work on something with no results. I mean, yeah, she had a bunch of typed pages, but no readers, no followers, and no income. That takes some resolve to work on something for that long not knowing if it will ever be published. But, she finally finished the book, so the hard part was over. Not. Now all that was left was having the work of your life rejected over and over. Nope, not hard at all. 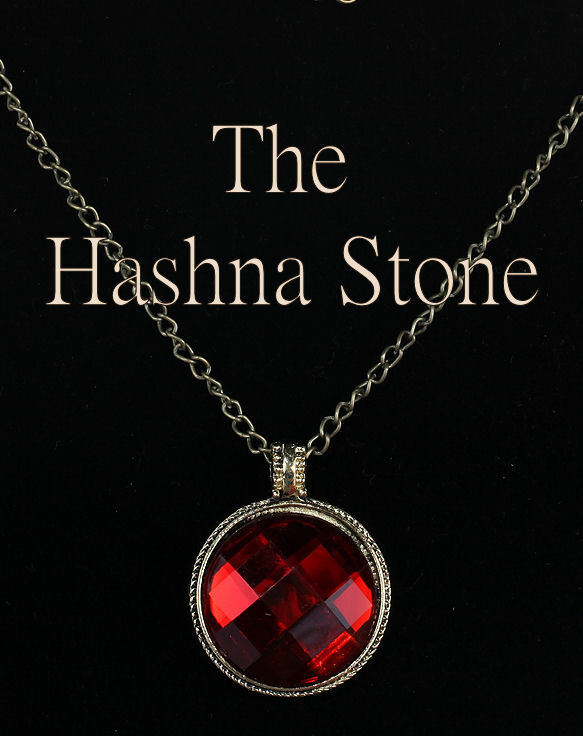 Publishers rejected the book at least 12 times before anyone would take it, and this is after she got an agent to take it (which is another time-consuming, soul-crushing journey). Because she was willing to take the knocks and not give up, there are now more than 450 million of her books in print and they are read all over the world. Rowling is now Britain’s 13th wealthiest woman—wealthier than even the Queen! If that isn’t inspiration, then I don’t know what is. I’m ready to be packing the dough. Bring it on! And those are the words I want to leave you with. When your dream seems impossible and you’re stumbling in the dark, don’t forget to turn on the light! 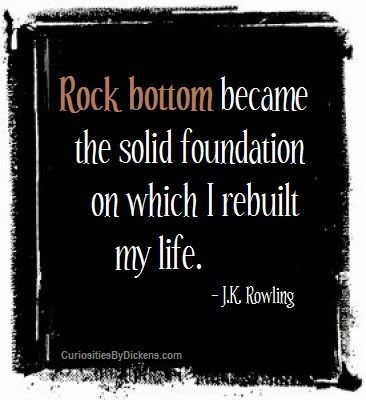 Does J.K. Rowling inspire you to keep working toward your goals? (If she didn’t, I bet Dory did 😉 ) Leave me a comment and tell me about it. This is part of my Operation Inspiration series. The button below holds more inspiration than you can take. Just what I needed to hear to start my week! Can you imagine if they all got together? A congress of wizards. It seems that wizards are isolated in great literature, the staff of Hogwarts notwithstanding. But even in isolation wizards inspire millions over years. Merlin has. So has Gandalf. Time will tell for Dumbledore. As for real people (outside of lore) whose path toward success is like one I’d like to follow, I can’t think of any. I am inspired by friendship. By how people are and what they choose to do. I had a spiritual friend who once (and many times) challenged me: “When you decide, ask yourself what is the loving thing to do.” Now that I think of it, I guess he’s an inspiration. He led a self-destructive life, then changed to become a person of faith, a steadfast husband, a reliable father, and a solid worker, too. With a totally unglorious job that he did with zeal. Yeah. That’s inspiration. That is a great inspiration! It’s difficult to turn your life around like that. Good for him! I’m so glad it helped you! J.K. Rowling is such an amazing person, and an inspiration to all of us. Sounds good to me 🙂 I’ll see you there! Wow! I am glad you wrote this. I loved all of the Harry Potter Books, but I did not know J.K. Rowlings story. Now that I do, she is an inspiration! That must have been so hard for her, I am so happy she finally recieved the recognition that she deserved. I think a lot of people want life to be easy, and great things to just be given to them. But that is foolish. We have to work hard to get that great life we all want. I’m so glad you enjoyed it! 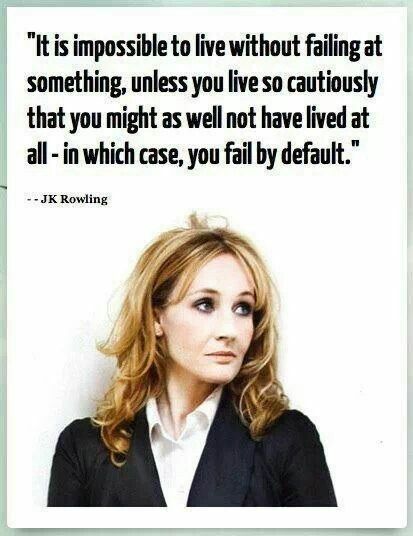 Rowling is such an inspiration. I didn’t know her story until after I’d read the books. They took on a whole new meaning once I knew her story. There is another Harry Potter book coming out! It’s called The Cursed Child and will be released some time in July after the play comes out. (Yes, it’s a play too! But I think it’s only going to be in London 😦 ) This new book is set 19 years after the end of the last Harry Potter book and it’s about Harry’s son, Albus Severus. Could not be more excited!!! WOW! Thank you so much for telling me I cannot wait for this, YAY! 😀 J.K. Rowling will be the author, correct? Aweh let’s go to London and see it! Haha just kidding. I know, I wish I could go to London and see it! I hope somehow the play makes it over here to the U.S.
J.K. Rowling will be the author, though it isn’t a normal book. It’s the play in written form. It would be so much more fun as a regular book. I don’t know why she doesn’t. It would definitely go over really well. There are so many HP fans and every one of them wants a new HP book. And the story sounds so interesting. I’d love to see what life is like for Albus 19 years later. Me too!! Maybe she just doesn’t want to be a writer anymore.. I am not sure. 😦 What other types of books are your favourites? I guess she’s just done with middle grade/YA fiction. She wrote a book for adults under a pseudonym a while ago. I guess she just wanted to write for a different audience. I love everything fantasy…high fantasy, urban fantasy. I like dystopian stuff too. And historical fiction. I love that you can learn about history in such a fun way. That makes sense. Oh interesting! I didn’t know that. I guess I am not good with categorizing my genres, what are some of your favourite authors? Have you read any of Phillipa Gregory’s books? I love Joe Abercrombie’s books. I’ve read one by Phillipa Gregory: The Other Boleyn girl. It definitely kept me turning pages! My question is much simpler, how did you find the last meme? That’s so funny! I saw it on Pinterest. I couldn’t resist using it. It’s just great!